ISOLUTE SLE+ Supported Liquid Extraction plates and columns offer an efficient alternative to traditional liquid-liquid extraction (LLE) for bioanalytical sample preparation, extracting up to 400 µL aqueous sample. 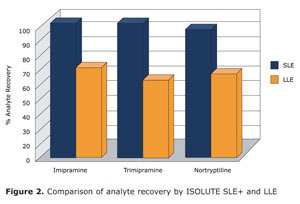 ISOLUTE SLE+ provides high analyte recoveries, eliminate emulsion formation, and cut sample preparation time in half. Supported-liquid extraction mechanism is very efficient, delivering higher analyte recoveries and cleaner extracts than the equivalent LLE method. Emulsions cannot form because the sample and water immiscible extraction solvent are never in direct contact, preventing contamination and maximizing analyte recovery. ISOLUTE SLE+ plates and columns provide an easy-to-automate alternative to traditional liquid-liquid extraction. No manual ‘off-line’ steps (capping/mixing/centrifuge/de-capping) required. All procedural steps can be fully automated with no manual intervention necessary. The ISOLUTE SLE+ plates and columns are packed with an optimized grade of diatomaceous earth, providing reproducible flow characteristics from well-to-well. Aqueous samples and extraction solvents load evenly across the plate, an important feature for automated sample preparation procedures, where well blockage can lead to loss of valuable samples. High extraction efficiency and elimination of emulsions provide higher analyte recoveries and lower detection limits as seen in Figure 2. The water immiscible extraction solvents used in LLE can also be used for ISOLUTE SLE+ procedures. Sample pretreatment conditions are also the same, meaning existing LLE methods are easily transferable to ISOLUTE SLE+, reducing method development time. Each plate is made up of 96 individual wells, each containing a modified form of diatomaceous earth. ISOLUTE SLE+ is available in formats suitable for processing from 200 µL to 10 mL.